On August 30, 2016, CustomInk kicked off its sixth annual Be Good to Each Other bullying prevention campaign. The campaign unites and encourages people of all ages to take a stand against bullying by promoting kindness, acceptance, and inclusion. Now through October 31, CustomInk will donate profits from the sales of bullying prevention t-shirts to benefit PACER's National Bullying Prevention Center in its efforts to engage, educate, and unite communities nationwide. CustomInk has partnered with a roster of prominent celebrities ranging from actors to athletes to design limited edition t-shirts as part of the campaign. 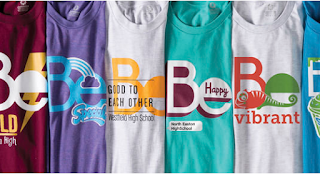 Influencers were encouraged to use the word, "Be" to create their own inspirational message to be featured on a shirt. Phrases include "Be Unique" (Charlie Puth, platinum Recording Artist), and "Be an Includer, Not an Excluder" (Lizzy Greene, Actress). Now anyone can customize their own bullying prevention t-shirts! If you are planning to run your own bullying prevention event, CustomInk has a wide variety of customizable templates so that you can create custom t-shirts for your school, club, or community group. To see more, head on over to CustomInk's Be Good Campaign! Those t-shirts are great! It is so great that everyone can do it. How fabulous that the Sponsor and you are supporting such a great cause. No child or person should live in fear. Wow, sounds so easy to do. I wish I can do this kind of shirt too! Oh, these shirts are nice. I wanted to have a business of customizing shirts and pillows. I love supporting companies with a cause that's close to my heart. Bullying is a serious issue and it's important that we raise awareness to help stop it. I think these shirts are amazing! These are great shirts!! I love when companies support a great cause like this! I love this! I would really like the white and pink one. That pink is my favorite!